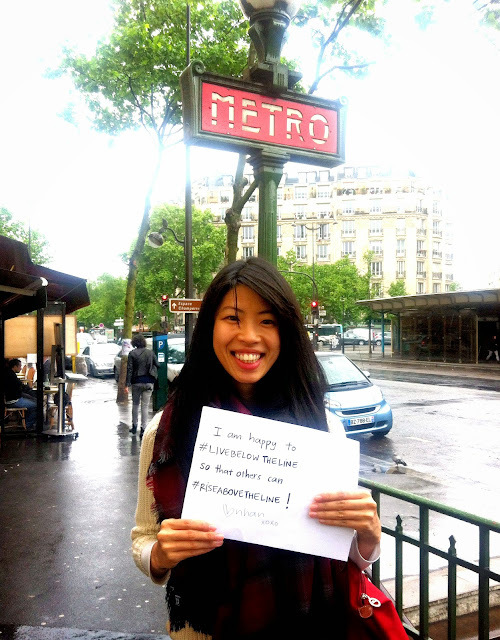 My Love for Paris: I am happy to #LIVEBELOWTHELINE so others can #RISEABOVETHELINE. I am happy to #LIVEBELOWTHELINE so others can #RISEABOVETHELINE. It's Thursday night here in Paris and I'm on Day 4 of my Live Below the Line Challenge. The hard part is now over (I hope!) and even though I've already eaten Friday's breakfast allowance, I think I'll manage to get through the last day. The hunger pains, constant staring at strangers eating their biscuits, chocolate, ice creams etc and sheer exhaustion (to a point beyond 'hangry') have all come and gone in their cycles. The challenge has been harder that I thought it would be, especially being in Paris when I am constantly running around catching buses, trains and metros all day. This morning was particularly difficult, it started with those headaches people on the challenge had been talking about. I was doing my fair share of sooking and zombie-like impersonations around the apartment until I decided to spend the morning reading up and signing petitions to Bring Back Our Girls before heading to work. Needless to say, my second, third and fourth winds came rushing in. My energy levels skyrocketed to an all time high on my 1.34€ budget and I was determined more than ever to #livebelowtheline so that others could #riseabovetheline, making a small difference where I could. My headache was just going to have to take a raincheck. When I first started my Live Below the Line challenge, I was only aiming for $100. I was a newbie and didn't want to put too much pressure on myself. Also, I felt really awkward about the idea of asking people for money, even if it wasn't for myself. I wanted my personal campaign to be primarily about raising awareness and using social media to make some noise about this amazing Australian programme that started in a backyard in Melbourne. Any odd donations here and there would have just been a fantastic byproduct. I got really excited about my campaign. 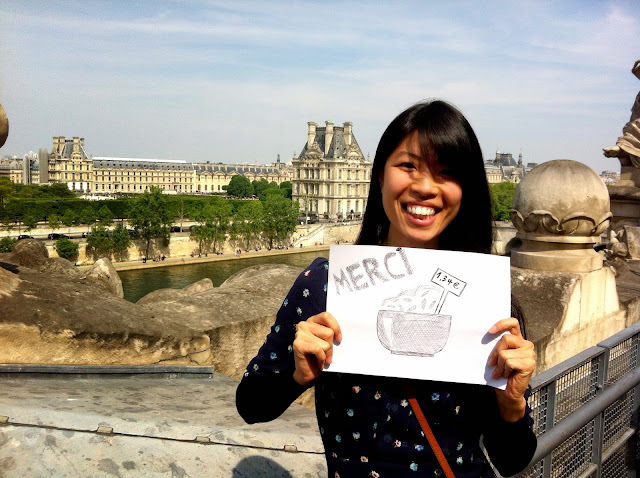 I wrote to Live Below the Line, to the Global Poverty Project, I wanted to bring it to France in the future. I was going to use my blog, its Instagram account, its Facebook page, my personal Facebook page, anything I could access to get behind this initiative because I genuinely believed that education IS the key to exiting one's poverty cycle and what better way to help someone, than by helping THEM help THEMSELVES. I did some spamming on social media (and apologised my friends in advance for flooding their news feeds over the next week) and prepared the food rations for the next 5 days at 1.34€ per day. Then all of a sudden, the donations started coming in, but at surprising amounts. I wasn't hoping to raise so much but soon people were donating from Adelaide, Melbourne, Newcastle, Canberra, London, Paris, New York, Singapore, Stuttgart..! People I hadn't been in touch with for years, people I had never met through my blog, random people on Instagram were getting in touch with me and sending their support. It reinforced my initial idea behind raising awareness over raising money. I was moved by the amount of money flooding in taking me up to rank 37th among 10,665 Australians (YEP THIRTY SEVENTH!!!) with a running total amount raised being $1469. But I was even more moved by the words of support, the messages about how seeing my challenge had made people I knew reflect and realise how lucky they were. Among other surprises, were friends who I didn't expect to donate at all. Friends I knew were facing their own personal financial difficulties. They sent in their donations and I didn't even look twice at the sum, it didn't matter at that point, I just stared at their names in awe of their gesture because every like, every comment, every share, every single click of their mice or tap of their smartphones was sending an emotional wave of honour through my body. I knew that everyone had their different personal circumstances. Everyone also has their preferences to which cause they support or feel passionate about which I respect and understand. I was even a little annoyed that Live Below the Line had recommended suggested amounts to donate even though I understood why it was done and how it could show people what their donation would achieve. But I genuinely feel that there are so many things you can do to help a cause, subconsciously, indirectly, even when you don't have the budget or the financial circumstances to do so. Like your friends' efforts on Facebook, their photos, their status updates, their links, like Live Below the Line, like the things on your friends' pages and Live Below the Line's page. Don't be afraid to comment. A simple comment makes a participant feel so good which will help then get through their day. Share the link, spread the news. Raising awareness within the 5 days, getting conversations started, throwing ideas and thoughts around the room and creating change one small step at a time does not require money. You don't need to donate $100 to make an effort towards ending poverty (although for those that did, I am incredibly grateful!). But honestly, a simple click within your personal social media network will bring the event up in your news feed, which will be then viewed by an acquaintance you met many moons ago who will then pause, and perhaps click on the link out of curiosity. They may then mention it in passing to a colleague at work, who will then be reminded that their other friend is doing the same challenge too. The work colleague will then write a comment of support, who will give their friend an extra boost to continue with their campaign, post something interesting up, which may in turn be the post that precedes the donation. Enter in the hashtag livebelowtheline (#livebelowtheline) and check out the photos - do the same, click like on some random participants, heck comment if you want to! Reaching out anonymously is a beautifully liberating feeling and receiving a 'like' from someone you have never met is a real unexpected pat on the back. Google it yourself. Increased traffic to these sites will help the people behind it feel good that they are making a difference and raising awareness. I know this because I manage my own blog. Looking at statistics and traffic makes me jump up and down and clap to myself. This will then fuel their energy to do more. Maybe not this year but next year. Maybe not for 5 days but for 1 day. People who have the means to donate can choose to donate (if Live Below the Line aligns up to their passions and preferences). People who don't have the means to donate can always help the cause in just as meaningful a way. Take a moment to reflect on your personal circumstances. Use it to your advantage to help you get you through your lows and celebrate your highs. If for only a split second you pause and think, well I suppose things aren't that bad for me, then the campaign has achieved more than it had ever hoped for.